When wellness is at the forefront of everyone's minds, we often hear about more natural, healthier alternatives to our day-to-day practices. One such example that's worth calling out is ditching store-bought toothpaste for a made-from-scratch version. Brushing teeth with baking soda is a buzzy practice that more and more wellness-minded individuals are getting on board with—but is baking soda an effective replacement for toothpaste? And is it safe? 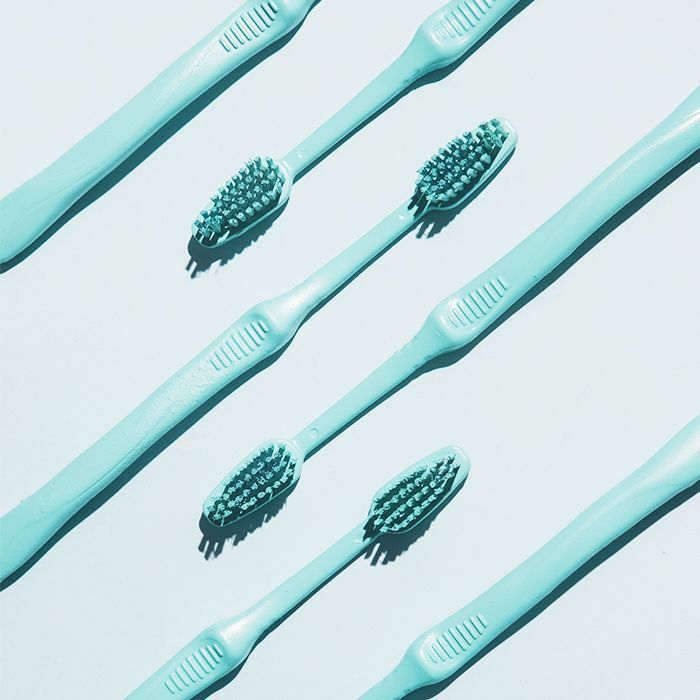 To answer such questions about brushing teeth with baking soda—and see if the DIY dental approach is worth giving a shot—we reached out to Kristy H. Bae of Miracle Smile Dentistry in Los Angeles, and she certainly had some thoughts on the subject. "I don't recommend it," she stated with little hesitation. The top reason she listed was that it's abrasive. The granular composition of baking soda can harm the enamel. "For certain people, their enamel is very thin," explains Bae. "Brushing with baking soda will accelerate the thinning of their teeth." Another reason Bae is not on board with replacing your store-bought toothpaste with this DIY version is that you're missing out on things like flouride—found in many toothpastes—that strengthens your enamel and protects from calories. "I think if you're looking for a more organic toothpaste, there's a store-bought option that's out there," notes Bae. You can also opt for a baking soda formulation that's much less abrasive than the real deal and made to be "more like a paste rather than a baking soda powder." On the topic of using baking soda as a teeth whitener, Bae says there's less harm as you aren't scraping the enamel. Still, she says there are more effective alternatives. "I don't think you get the kind of results that professional or even over-the-counter whitening products would offer," explains Bae. While she says it can still help to whiten, it's not as predictable. "There are so many superior products that can whiten right now." Ready to go more natural without damaging your enamel? Here's a new toothpaste that's like oil pulling for people who hate oil pulling.